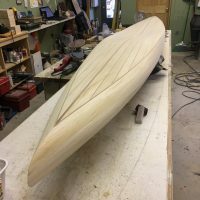 Hollow wood paddleboard construction techniques are common to many different hull shapes. 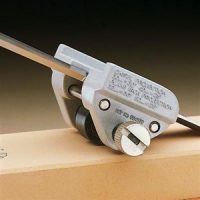 The build method for all the boards I design is strip planking. 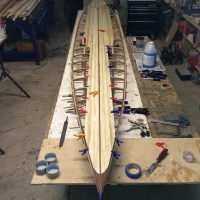 Strip planking, for those not familiar with the process, is the application of strips of wood to a framework that is in the shape of the board (or boats, among other shapes). Many rowing shells were built before the advent of epoxy, fiberglass and carbon fiber technology in this fashion and were “state of the art” until modern plastic technology became the norm. 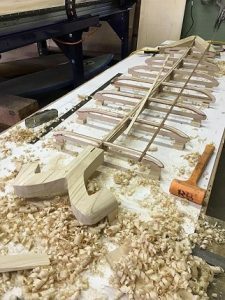 The basics of strip planking in the case of paddleboards is slightly different than kayaks or canoes in that the entire framework stays inside of the board. The structure of a strip planked paddleboard is semi-monocoque https://en.wikipedia.org/wiki/Semi-monocoque, or in other words, a “torsion box” type of structure. A “skin” that remains attached to a subassembly, such as a light framework, is incredibly strong…think aircraft wing. Paddlers that have been around the paddling and surfing sports for any length of time likely know prone paddleboard background and also know the basics of how various sports relate. Prone paddleboards are the very most basic paddle craft on the water. The element of simplicity, versatility and cross-training possibilities for prone surfers, plus the pure fun of paddling, bind prone paddling to all the other paddling sports. We decided to go back to the roots of paddleboarding for this design. With the ongoing growth of all paddle sports, it isn’t surprising that prone paddle boarding has seen a resurgence. Many people involved with paddle sports paddle more than one type of craft, and even though prone paddling doesn’t involve a paddle. it’s still paddling. 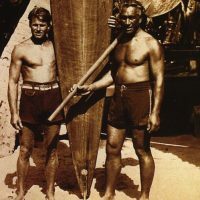 Prone paddleboards were the first “paddleboards” to be raced in the modern era going back to the first Mainland to Catalina race that Tom Blake won on his chambered wooden board in 1932. A lot has changed since 1932 but one of the things that has not is the pure fun of paddling. Paddling a light weight hollow wood board combines the best of both worlds; beautiful wood watercraft and modern building techniques. Prone paddling is another great way to get on the water. Prone paddlers that also surf traditional surfboards get the added benefit of paddle fitness when are hitting the waves. 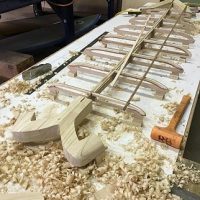 Many of you may be familiar with the TreetoSea forum which has been the primary forum used by many hollow board builders over the last decade or so, to share ideas and learn about the process of building hollow wooden boards. The Tree2Sea forum was a great place to learn and share for many years. Unfortunately, the administrator of the Tree2Sea forum has not continued to manage the site, and consequently, it has degraded into a “spamfest” with very little new information being posted.